In blender, combine sour cream and chipotle pepper in adobo sauce. Blend until combined. Set aside. In large skillet, cook turkey as specified on the package. Always cook to well-done, 165 degrees, as measured by a meat thermometer. Add taco seasoning and water. Cook until water is evaporated, stirring occasionally. To make the pico de gallo, combine tomatoes, onion, cilantro, jalapeno, lime juice, salt and freshly ground pepper, if desired. Spread each tortilla with sour cream mixture. 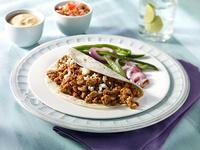 Fill tacos with turkey, grilled peppers, onions, pico de gallo and queso fresco cheese.